Have you been on roller-coaster rides ? That thrill of a few minutes of laughing and screaming at the top of your lungs. You wouldn’t want it to end. Don’t you ? 🙂 The roller stops, and you’re back to your senses. Wow.. what a ride that was.. ! That if you come back to your senses. What if you don’t ? Well, my guess is that 1 ride will not be not enough and you would want more rides ! On a larger perspective, I do see my life like a roller-coaster. Too much thrill , fun and good times pulling away the reality from me. All that is in view, in perspective of a ‘good time’. And having want more and more of it. I would seldom pause, stop to look back or to swallow reality in. Life is taken granted for. Let’s face it ..many things are… Most of the things that we go through now benefits us only for this life here.. to suit our own personal purpose of living in this current life…Many of us do.. Think about it. How many of you take your ability to walk for granted? Do we appreciate even for a sec that we are granted with these blessings of being ‘able’, or being healthy ? Able to think, able to speak .. able to laugh.. Giving that meaningful pause to your self once in a while is good. We should not take things for granted. I am not Ngae, and thus I do not have the absolute right to claim that i know what it was like to go through what he went through.. This time last week, he was alive .. This time last week, he was.. walking about… To be exact, this time last week was his last few hours in this life. What was going through his mind .. I wonder.. at that point.. I spoke to Raymond Ng(a common friend Ngae and I share) last week before Ngae’s cremation. We both wondered, if we knew what was going through his head during his last few hours. What would it be.. ? and we spoke on how the past few months have been anything pleasant for him. How he can’t do a lot of things which we can, which we take granted for. If you’re familiar with my way of writing, post contents are usually meant to benefit both the writer and reader.. I do not feel like laughing now.. or feel happy.. It was Ngae’s last few hours, all alone , and depressed.. while almost all of us were having a pretty , relaxed Saturday, looking forward for Sunday’s NB15K only to be awaken by the news of his passing.. It’s 2.54pm now..22nd May 2010.. Exactly a week ago, around this time.. Ngae has convinced himself that his time is up. . .. Obviously none of us knew what was coming.. Life is not like the fictional characters which we have known.. there’s no Doraemon, witch, magic or gipsy who can tell foretell us what will happen to who, what time, and how..or rewind time to do copla fixin’..
Well, that’s the whole beauty and magic of life.. You really gotta put your effort in anything,in everything.. non-reliance or dependence on luck.. on help.. Nak seribu daya, tak nak seribu dalih. Let me lead back to my main message here…If we really care for a person, show to ’em that we care. If we want to say Hello to someone, for goodness sake, pick up that phone and give that person a call. If you feel like meeting someone, take the effort to find out if that person is free to meet up for a drink. You would not know when is the last time you may get the chance to communicate with that person, again. Gone too soon wouldn’t be too soon if you’ve fulfilled your intentions to keep a good relationship with a person.. it does not have to be constant, it does not have to be so frequent (remember this >> effective communication). Gone too soon wouldn’t be too soon either if you have achieved what you want to achieve. I guess Ngae has fulfilled what he wanted to. I don’t know if it was too soon for Ngae, who am I to tell..right..? He’s gone now, that’s all I know. But his legacy lives on..and he shall live in our hearts forever, in your, in mine, for all the kind and positive things he did when he walked the earth, and for the lives he touched when he was breathing , walking and running about with us.. Reality here to stay. Keep on dreaming but stop taking things for granted…. I bow in silence and I’m offering my prayers for Ngae..wherever you are. You will always and forever be remembered, cherished and loved by many. We’re having a Memorial Run for you tomorrow. Hopefully everyone will show up in their sarong. 🙂 Keep on smiling Ngae..just like that quirky sweet smile you showed to those who payed their last respect to you.. And hey, you were as good looking as you were 20 years ago, when you had..hair ! 🙂 Btw, your wife Pin Pin just called.. she request that I read a note for those running tomorrow on her behalf, as well as the whole family. She has emailed me the note..Would be more than happy to do that favour for both of you, Ngae and Aunty Pin Pin..
missjewelz getting herself a batik. The lady was explaining to me the types of batik, and what to look for when finding a good batik ! I may be a Malay, but there are plenty more that I need to know and learn about my own culture. Tying a sarong is one of em ! ermm..the photo...not bad eh ?! Kemas ikatan tuh.. 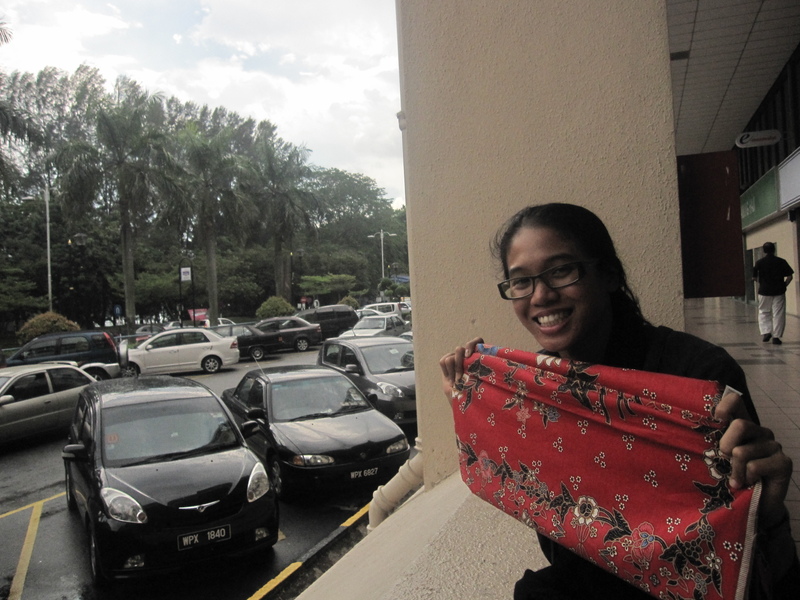 I'm 28, and this is my 1st piece of batik (no shame about it okay!!). I had one before , my mom's ! Used it when I was in boarding school la.. hihi. Well written, julie. Im sorry to hear about his passing. As you said, his legacy lives on.